1879 Gold Stella from Robbins Collection will be auction in Coins and Medals auction by Bonhams New York at the Madison Avenue galleries on December 17. 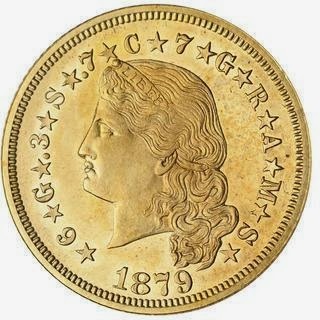 The 1879 Proof $4 Flowing Hair Stella gold coin is one of more than 300 fine examples of the Robbins Collection of Classic US Gold Coins. On 23 September 2013, a $4 dollars 1880 Coiled Hair Stella sells for $2,574,000 in Coins and Medals auction by Bonhams. Two examples of the 1879 Proof $4 Flowing Hair Stella Coin (est. $80,000-120,000 and $150,000-200,000 respectively) will be in the auction. 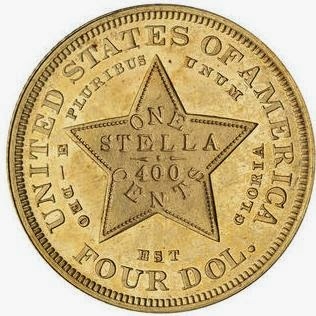 Produced at the end of the 19th century by the United States Mint in an attempt to join the so-called Latin Monetary Union, Stellas were never approved for circulation. Both examples have been graded Brilliant Proof by NGC. Of equal if not greater standing is a rare Panama-Pacific 1915-S 5 Coin Set with original Shreve and Company copper frame (est. $160,000-200,000). The half dollar, gold dollar, quarter eagle, $50 octagonal and $50 round are all graded between MS63 to MS65 by PCGS or NGC. The set was purchased by the collector at the 1915 Panama-Pacific International Exposition in San Francisco. Additional highlights from the Robbins Collection include an extensive run of original quality $20 Double Eagles, minted between 1850 and 1928, ranging in grade from Very Fine to Gem Brilliant Uncirculated, including the 1907 High Relief (est. $14,000-18,000). Also available is an original United States Assay Office Gold $50 (12,000-15,000), .887 reverse , multiple original Proof Sets from 1936-1940 ($6,000-7,000 each), an 11 piece Gold Commemorative Set (est. $14,000-18,000), among others outstanding examples. Paul Song, Director of the Rare Coins and Banknotes Department at Bonhams, stated, "Bonhams is delighted to have been entrusted with this lovely private collection, put together during the first half of the 20th century, with many of the coins being purchases from famed West Coast Dealer Abe Kosoff. All the coins have been off the market for at least 70 years, making this a rare opportunity for collectors to purchase a piece with exceptional provenance." The Robbins Collection of Classic US Gold Coins will be offered in the December 17 Coins and Medals auction at Bonhams New York. The auction will preview at Bonhams New York from December 14-17, and by appointment at Bonhams Los Angeles and Bonhams San Francisco.